"Reprinted without change in pagination from the Journal of Economic Entomology, Vol. 20, No. 2. pp. 392-399, April, 1927." A typical root-feeding mealybug (Ripersia radicicola Morrison) is found well distributed over the Island of Cuba on the roots of grasses and sugar cane. The mealybug is probably a native species which inhabits the roots of grasses and has adapted itself to sugar cane. "Grass-root mealybug" is suggested as the common name for this insect in preference to "sugar cane root mealybug," inasmuch as wild grasses are the primary host plants. The area of injury does not coincide with the area of distribution. Serious injury occurs in soils subject to drought where the mealybug appears to be only one of several factors unfavorable to the growth of the plant. The use of legume cover crops in areas where the grass-root mealybug is a serious pest, to improve the soil and suppress the grass hosts, is under consideration. During the past two years considerable interest has been manifested in a mealybug found feeding upon the roots of sugar cane in several localities in Cuba. This interest has been intensified by the fact that the insect was reported as undescribed, which led some to believe that it was a pest recently introduced into Cuba. An effort has been made to obtain as much information concerning this insect as other work in progress would allow. The purpose of this paper is to summarize these observations and to discuss certain points that they raise. "Mealybug" and "chinche harinosa" are terms familiar to all who have had experience in growing sugar cane. Besides the mealybug under discussion, which occurs on the roots of grasses and sugar cane, two species of stalk mealybugs have been encountered in Cuba. They are widely distributed. They are red or gray soft-bodied insects, covered with a white powdery or fluffy substance, occurring in clusters, usually at the nodes under the leaf-sheaths of the cane stalks. It is the white powdery covering that is responsible for the common names "mealybug" and "chinche harinosa." While the general appearance of mealybugs feeding- on a plant is such that they may be easily recognized as a group, it is not so easy to distinguish between the different species. The common stalk forms may be found on the cane from the time it starts to germinate, and they are often seen beneath the surface of the ground, clustered around a germinating bud, or at the base of growing stalks. It would not, there'Scientific Contributions No. 8, Tropical Plant Research Foundation. From the Cuba Sugar Club Experiment Station, Central Baragui, Cuba. fore, be surprising if another species feeding on the roots was thought to be identical with the stalk species and if the fact that this other species constituted a potential pest had been entirely overlooked. Such seems to have been the case. "October 3, 1916. Fields are very uneven and there are many spots near the roads that are not thriving. Numbers of mealybugs, comejens anti beetle grubs were found at the roots of cane. Easy to pull up. Probably 5 to 10% of the old fields so affected. Mealybugs are most abundant, both on the cane and at the roots of cane examined." Mr. Crawley stated that he could remember that the mealybugs in question were often noted on the smaller roots, but he did not attach any particular significance to the fact at that time. It is very probable, in the light of what is now known concerning the distribution of the grass-root mealybug, that Mr. Crawley observed this insect at that time. It can therefore be stated with reasonable certainty that the root-feeding mealybug was present on -the roots of sugar cane in some districts of Cuba as early as 1916. In October, 1924, attention was called to a mealybug designated as Ripersia sp. (2),2 which was found infesting the roots of sugar cane in Cuba. Ballot (1, p. 46), in his list of scale insects and mealybugs of Cuba, published in April, 1926, includes Ripersia sp. as having been collected at Camagfley by Bruner in 1923. Van Dine (6, p. 11 12) records Ripersia sp. in his list of sugar cane insects and mentions its occurrence on the roots of numerous grasses in the Provinces of Oriente and Camagfaey. Myers (5, p. 99) also mentions Ripersia sp. as having been observed at Soledad in Santa Clara Province. Finally, in October, 1926, Morrison (4) published a description of the species under the name Ripersia radicicola n. sp., basing his description on material submitted from the Provinces of Oriente, Camagfiey, and Santa Clara. 2Numbers in parenthesis refer to references listed at the end of the paper. not seem to be the case. The common name "grass-root mealybug" is suggested because of the importance of wild grasses as host plants. If this root mealybug limited its feeding to the roots of sugar cane, or even showed a preference for them, it might appear to be a pest which had been introduced in some way as a result of the extension of cane planting. It has been repeatedly observed that many different species of grasses are infested, and in many cases it is evident that the infestation is in no way related to the planting of sugar cane. In fact, infestations have been noted on the roots of grasses growing adjacent to cane fields in which the roots of cane stools were found upon exammiation to be uninfested. In a few cases mealybugs have been found on grasses growing in areas far removed from cane fields. 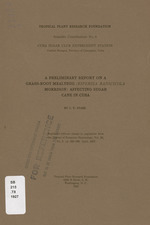 On the basis of these observations it is reasonable to assume that the root mealybug is a typical grass-root feeding species, that it is probably native or at least that it has been present in Cuba for a long time, and that under changing cultural conditions, brought about by the rapid extension of cane plantings, it has spread to the roots of sugar cane. The distribution of the grass-root mealybug over the Island has not been fully determined. It was first noted by the writer on the roots of grasses and sugar cane growing on the plantation of Ingenio Jobabo. The infestations there were limited to areas where the soil was comparatively light and well drained. Records were made of infestations on the roots of grasses growing on ditch banks, in guardarrayas, along the edges of cane fields, and, in some cases, well within the cane fields. When the infestations were found on the roots of sugar cane, their location often indicated that the source-might have been the adjacent guardarrayas, in as much as the areas infested were usually small semicircular *patches spreading from the edges of the fields. This was especially true where the guardarrayas had been planted to sweet potatoes (boniatos) and the natural grass hosts had in this way been suppressed. Later, more widespread infestations were found in the Province of Camagiley. The following fragmentary records are given to indicate the localities in which the grass-root mealybug has been found. These records are taken from the survey reports made by Dr. Wm. H. Weston, Jr.,Dr. R. V. Allison, and other members of the staff of the Tropical Plant Research Foundation. While these records indicate the presence of the mealybugs in the localities observed, they do not furnish information regarding the abundance or extent of the infestations, nor do they show the limits of, distribution. The authority for the observations is given in parenthesis. As has been mentioned before, the grass-root mealybug has been found on the roots of a large number of grasses. The following is a list of these plants as far as they have been determined. Grass Root Mealybug, Ripersia radicicola Morrison. 1, Mealybugs clinging to the roots of sugar cane. (Original). Sugar Cane Stalk Mealybug, Pseudococcus boninsis Kuwana (Van Dine). 2, Mealybugs on node of sugar cane after leaf sheath has been removed. 3, Mealybugs clustered about the base of young cane stalks. reports that he has collected the grass-root mealybug on the roots of Johnson grass (Holcus halepensis). It will be noted that the majority of the grasses which have been found to be infested are annuals. This does not necessarily mean that the perennials are not host plants, but it indicates that the annual grasses are of primary importance as hosts. Roots of such grasses as paran (Panicum barbinode) and Guinea grass (Panicum maximum) growing in infested areas have been examined many times, but the root mealybug has never been found on them. It is not possible with the literature available to discuss in detail the relation between the grass-root mealybug and other root-inhabiting mealybugs. A number of reports have, however, been noted in which the occurrence of mealybugs on the roots of sugar cane and grasses in other countries has been mentioned. Lefroy (3, p. 759) mentions Ripersia sacchari Cr. as living on cane as well as on rice and grasses in India but does not state that it is found on the roots. Ripersia internodii Hall, reported by Willcocks (7) from Egypt, appears to be a species that feeds on grasses and sugar cane, both above and below the ground. It is, however, said to feed on the nodes and internodes of sugar cane. In the same report Pseudococcus variabilis Hall is mentioned as a common grass-root feeding species which is found well up on the jointed canes and around the nodes of sugar cane. Pseudococcus trispinosus Hall is also reported as feeding on the roots of sugar cane and grasses. From these scattered reports it will be seen that it is not uncommon to find the roots of grasses infested with mealybugs, as well as sugar cane. the base of the plant. The stalk species has not been found on grass, but it may be present on some of them, especially the large cultivated types. When a plant is pulled up some of the root mealybugs usually cling to the roots by means of their mouth parts, which they insert in the tissue of the roots (P1. 13, Fig. 1). There are other underground mealybugs which are commonly found on weeds and grasses in Cuba. A common weed, romerillo (Bidens sp.) is frequently found to be infested with mealybugs below the surface of the ground, and it has been reported that romerillo is responsible for the presence of the grass-root mealybugs in the cane fields. The species feeding on romerillo is found on the underground portion of the stems rather than on the roots, and it has not been found on the roots of sugar cane. Several grasses have been found to be infested in the crown by the romerillo species, which Dr. Morrison has determined as Pseudococcus virgatus Ckll. In common with other mealybugs, the grass-root mealybug is always attended by ants, which care for and protect them in return for a sweet substance known as honeydew secreted by the mealybugs. The most common attending ant is a small, inconspicuous, almost black species, which has been determined by Dr. W. N. Mann of the United States Department of Agriculture as Tapinoma melanocephalum Fabr. This ant, whose nests have been found at the base of the infested plants, is very assiduous in its attentions, and when the mealybugs are disturbed will pick them up and scurry about in search of a hiding place for them. It is very probable that these ants are largely responsible for the spread of the mealybugs. In fact, plants grown in pots for experimental purposes have become infested in such a way as to show conclusively that the mealybugs had been placed on the roots by the ants. Myers (5) reports a large ant (Odontomachus haematoda insularis Wheeler) in close association with the. grass-root mealybug in the Soledad (Cienfuegos) area. Occasionally the fire ant, hormiga brava (Solenopsis geminata Fabr. ), has been found associated with the grass-root mealybug, but the fire ant is more commonly found attending the stalk mealybugs. Fig. 18.-Plots of Sword Beans (Canavali gladiatar) in the foreground, showing the vigorous growth and excellent cover made by this plant. (Original). conditions, vigorous cane plants have been found to be heavily infested with root mealybugs. Often fields are found in which the plants are comparatively heavily infested but do not show any visible effect of the infestation. In other words, the area of injury from root mealybug does not coincide with the area of its distribution. It is probable, therefore, that the severe injury which follows a heavy infestation of the grassroot mealybug results from a number of unfavorable factors, of which the mealybug is only one. of improving the condition of the soil and suppressing the grasses in badly infested areas, has been considered. Certain legumes, such as sword and jack beans, make a rapid, dense growth which seems to be very effective in keeping down weeds and grasses (Fig. 18). These beans are not host plants for the grass-root mealybug. Their value in farm practice as a means of soil improvement has long been recognized. discovery of practical control measures. Estac. Expt. Agron. Bol. 51, 47 p.
4. MORRISON, H. 1926. An apparently new sugar-cane mealybug. Jour. Agr. with a list of the coccids of the district. Harvard Inst. Trop. Biol. and Med. - Contrib. 3, p. 69-110, illus. 6. VAN DINE, D. L. 1926. A list of the insects affecting sugar cane in Cuba. Trop. Plant Research Found. Bul. 3, 16 p.
7. WILLcocEs, F. C. 1925. The insect and related pests of Egypt. Volume II.